If you missed out on our latest Facebook LIVE broadcast, then check out the link below to get all caught up! Trick Dog Champion + Trick Dog Judge = ONE AWESOME LIVESTREAM! 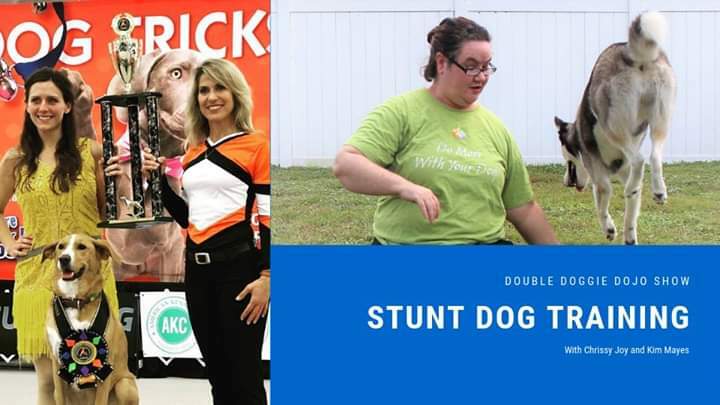 You will not want to miss these two professionals talking about trick and stunt dog competitions. How to begin this new dog sport with your canine companion. This was one of the most fun interviews to do, so if you have an interest in getting involved in Trick and/or Stunt Dog training or just learning about the sport, then please check this out. This interview was with the amazing Chrissy Joy, her dog Beasley and our wonderful host, Trevor Smith of the Doggie Dojo. Chrissy Joy is the first person to achieve the National Stunt Dog Championship at this year’s 1st ever Tridex competition held in March 2018. She is such a great person and has done many great acting gigs with the fabulous Good Beasley, including his well-known commercials for Chewy.com. She is a fabulous performer and will give you great tips on what it takes to strut your stuff on the stunt dog scene. Trevor Smith is an amazing trainer and our host of the Doggie Dojo show. His wonderful training techniques are a must on social media and he has inspired many with his positive attitude and easy to follow training tactics. He is also the best interviewer ever and I just love any time we get to collaborate on fun talks such as these. And yes, you get to here from me too, as to what I look for as a Trick and Stunt Dog Judge! There are lots of great links given throughout the interview for how to get involved at home, at mine and Chrissy’s training facilities and even where to go if you are interested in getting in to some animal acting. News & Events chrissy joy, competition, competitor, dog tricks, doggie dojo, interview, judge, kim mayes, spark teams, stunt dog, trevor smith, trick dog instructor, trick training. permalink.